I had wanted to read Earthbound from the moment I read the synopsis. I read Pike’s Wings a few years ago, and I really liked it. So I knew that I liked her work, and thought that she would do this story justice. And she did. It’s just not the story I thought it was. I thought that Earthbound would be a sci-fi novel. The title, and the synopsis just screamed sci-fi to me. Before you think about reading it – Earthbound is most definitely NOT sci-fi. I’m not really sure which category it falls under. Paranormal? Fantasy? I put it under both. But I had to mention the fact that I spent the first 200 pages or so waiting for some science fiction action, and was disappointed when it didn’t arrive. But I guess, in part, that is my own fault, for assuming that it was indeed a sci-fi novel. Apart from our rocky beginning and misjudgements, I liked Earthbound. I liked Tavia as a character, I liked her love interests. In fact, I really liked all the characters in Earthbound, and that is an extremely rare occurrence for me. I just think that Pike wrote all the characters clearly and well, and there was development for all of them. The one problem I did have with the characters was Benson. I thought that he accepted the predicament WAY too quickly. But, everything is revealed, and my annoyance disappeared along with this revelation. Tavia was likeable for a few reasons. Unlike some ‘broken’ heroines I have read about recently, Tavia didn’t complain, or throw herself numerous pity parties. Yes, she was upset. Who wouldn’t be after the death of their parents? But she didn’t spend the entire novel raging at her aunt and uncle, didn’t spend the whole novel complaining about how bad her life is. She elicited the perfect measures of sadness and acceptance of what had happened to her. And she didn’t move on to quickly, either. I think Pike has done a really good job of writing a character that is flawed in the most even of ways. 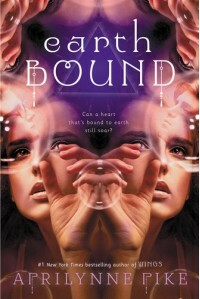 In Earthbound, we see Tavia grow from an unaware and seemingly normal eighteen year old girl, to a young woman who can fight her own battles, and can stand on her own two feet. I really like character development like this. It wasn’t dramatic; it was achieved over the course of the entire book, and at a good pace, too. While I wasn’t in love with either of the love interests, I was intrigued. Especially by Quinn. Sure, I did guess the reveal about him (in part), but he was interesting nonetheless. And the description of him was just downright swoon-worthy. I REALLY cannot say much more about him without ruining the entire novel, so I shall move onto Benson. Benson was a really cute nerdy librarian boy that I thought was adorable. He was so willing to accept Tavia, and to help her. It was incredibly sweet. And that was why I was just internally (well maybe not so internally) raging at him when his reveal came upon me. I have my doubts and hopes, and I really hope that Tavia will just hear him out. PUHLEASE. Okay, now writing this review, perhaps I did love the love interests. The story itself was really vague, and constantly kept you guessing (even if it wasn’t a sci-fi! ), and I really liked that. There was one part that I REALLY DID NOT SEE COMING. AT ALL. And I love it when that happens. I am notorious for guessing plots early on, and then nothing is a surprise – but Earthbound surprised me. Plus points for that. The pacing was really good. I liked it. A lot happened, but then not a lot happened – all at the same time. It’s the kind of pacing that I love to read about. It wasn’t so slow that I finished the book and felt like absolutely nothing had transpired, but it wasn’t so fast that it gave me whiplash, either. Pike has done an excellent job on the pacing in Earthbound, I must say. Overall, I liked and enjoyed reading Earthbound, and will definitely be continuing the series. There are so many questions that I need answers to! P.S. SO MUCH COVER LOVE. It's so gorgeous. Your Turn: Have you ever been completely incorrect about a book's genre? How did that influence your enjoyment of the story?